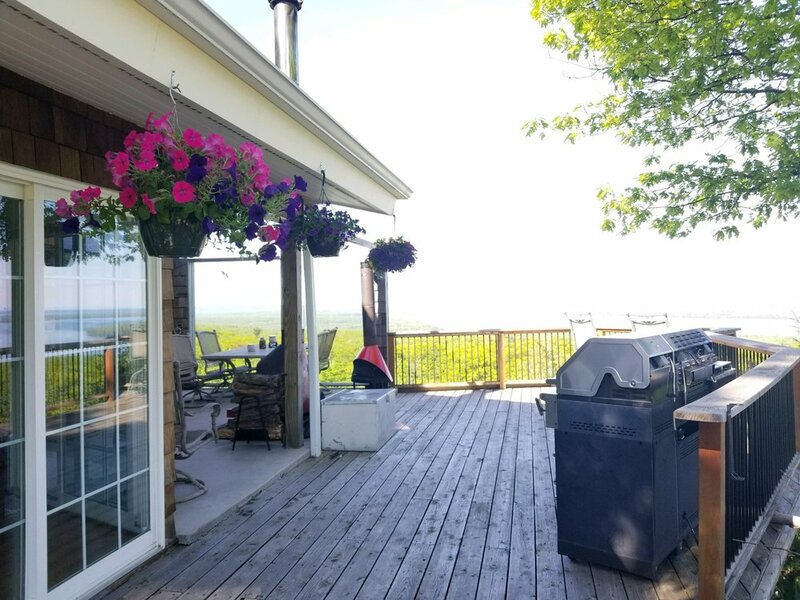 This beautiful estate property is located on 18 private acres with breathtaking views overlooking 12 of Lake Superior’s Apostle Islands. On a clear day you can also see three states, Michigan, Minnesota and Wisconsin. The Wright House is conveniently located 1.5 miles from Bayfield which Midwest Living Magazine calls “the best town in Wisconsin” you’ll find the area’s finest attractions, restaurants and shopping just minutes away. This unique home has been custom designed to enhance the estate grounds, with precise attention being paid to framing its spectacular panoramic views which are lovely in any season. Spacious and airy, with a signature wall of glass facing the lake, this large home is peaceful and quiet. Amenities include Wi-Fi, a full kitchen, loft, and generous common areas for relaxing. The outdoor patio area with its fireplace and nearby gardens is the perfect spot to enjoy a glass of wine and stargaze. This home is ideally suited for small groups, bridal wedding parties, and couples looking to escape for the weekend. Nightly rates start at $800 per night for up to 8 guests. An additional $25 will be charged for each additional guest over 8. A two night minimum is required at the Wright House. Please leave a review of your stay at the WRIGHT HOUSE! Thank you! We hope you enjoyed your stay at the WRIGHT HOUSE!